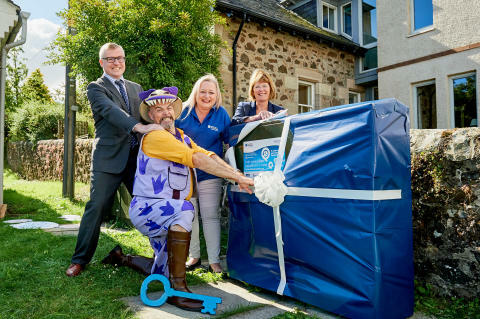 The Digital Scotland team celebrated fibre availability in the Perth and Kinross village of Glenfarg this week as they visited a fibre street cabinet that serves part of the local area. They were joined by Kevin Macleod - from Scottish family entertainers FUNBOX, who lives in Glenfarg - Councillor Kathleen Baird, and Openreach programme manager Ben Campbell. Other areas in Perth and Kinross to benefit recently from the Digital Scotland rollout, led by the Scottish Government, include more of Blair Atholl, Bridge of Earn, Inchmichael, Little Dunkeld, Caputh, Glenalmond, Kinrossie, Meigle and Spittalfield. More local coverage will follow as engineers from Openreach – Scotland’s digital network business – continue work on the ground. Sara Budge, Programme Director for Digital Scotland Superfast Broadband, said: “It’s fantastic news that the programme has been able to benefit residents and businesses in and around Glenfarg. Ben Campbell, Openreach programme manager, said: “Thousands of people and businesses across Perth and Kinross now have the opportunity to access their best-ever broadband speeds when they sign up with a service provider.